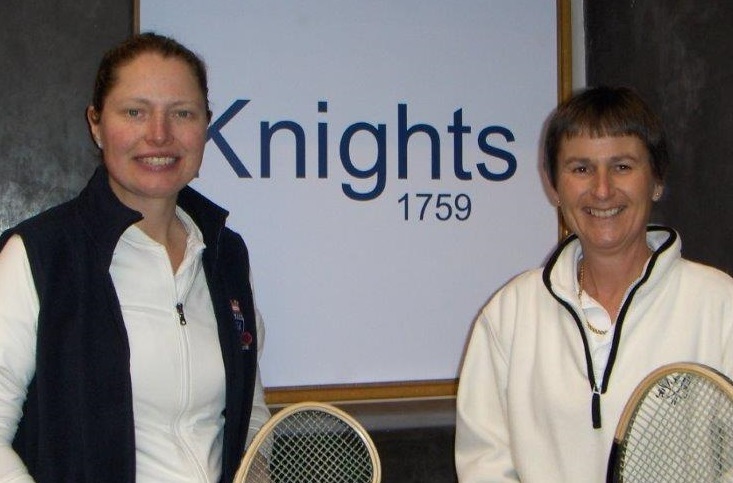 ​The tenth LRTA International was held at the delightful Hardwick House on a bright but chilly weekend, and when not warmed up from their matches, the players (and spectators) were extremely grateful for the woodburning stove in the dedans! 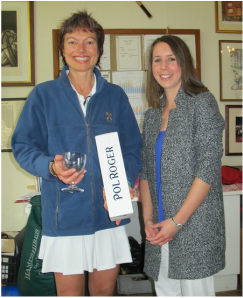 When Sarah Vigrass won the previous International, she commented - with a huge smile - that : ‘It’s lovely when Claire is in Australia’!! Sadly, Sarah Vigrass was unable to defend her title, as an unexpected work commitment intervened, so would Claire be echoing those words at the end of the tournament? 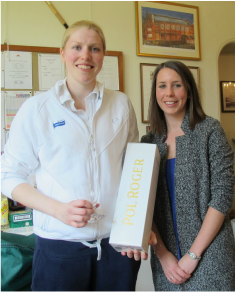 Claire is loving her new role as mother - Sophie Eleanor had arrived safely on 15th April, and kept her mum so busy that she had not managed to put a foot on a court until the first day of the tournament! 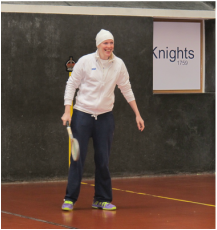 It was testament to Claire’s fitness that she was on court a mere two weeks after giving birth. We were delighted to have Rob and baby Sophie in the dedans during the first day of play - her first tournament, and how well behaved she was! ​The tournament was in its usual format of two round robin groups of four, so each player had two matches on Saturday and one on Sunday morning, followed by the final. 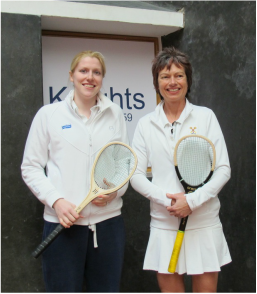 First on court were Tara Lumley and Elvira Campione, the latter was quickly into her stride, with her serves working well and her two handed volleys extremely effective, She did not allow Tara to get into rhythm. Elvira took the first set 6/1. Tara fought back in the second set, and saved two match points, but Elvira took it 6/2. Then we saw the experienced Alex Garside face the newcomer, Izzy Candy. Not fazed, Izzy settled in well, immediately playing above her handicap. Alex took a while to find her feet and Izzy took the first set 6/3. Alex then regained focus, Izzy faltered a bit, and this close set went to 5 all, with Alex then taking the next game. In the deciding set Alex continued to stay focussed, making fewer mistakes, but Izzy hung in there; twice she came back from love-40 down to win the game, and she got a couple of winning galleries. But in the end, Alex came through to take the third set and the match, 3/6 6/3 6/4. 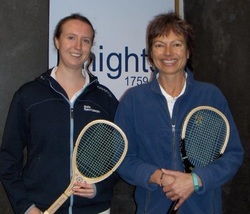 The next match saw the top two in Group A, Claire Fahey and Irina Dulbish, take to the court, and it was immediately clear that motherhood had not made Claire forget her game: very wisely, she didn’t chase down every ball or stretch too much, but with her level of skill, she didn’t need to; her placing of the ball, cut and pace (both speed and variation) were enough. Although Irina did what she could, and did well to take four games in the second set, Claire won the match 6/1 6/4. ​This was followed by the top two in Group B, Penny Lumley and Freddy Adam; the latter had gallantly stepped in when Sarah Vigrass had to withdraw. Freddy came out strongly, taking the first game, but then Penny got into the groove and took the next six. Freddy started the second set well, and went to 5/2 up, but Penny fought back, hitting harder, serving well along the edge of the penthouse and forcing Freddy to make mistakes. Finally, by winning the set 6/5, she won the match. This was the end of the first four round robin matches, expected to take until lunchtime-but it was already after 3pm! The first of the second round robin matches was Irina against Tara. Tara looked more at home than she had in her previous match, but Irina didn’t let her really get into her stride, keeping up the pressure to win 6/2, 6/0. Alex’s first match had been a three-setter and so was her second, this time against Freddy, who used pace to good effect, pressurising Alex into making mistakes in the first set. Having lost that 1/6, Alex went up a gear, in particular hitting more forceful forehands, and she took the second set after some close games, 6/4. The final set also saw close games, Alex fought hard and saved two match points, but eventually Freddy won 6/3, after almost two hours on court. 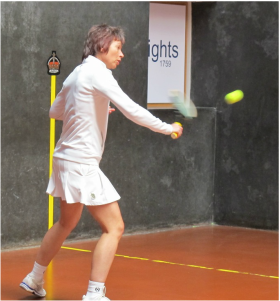 The last two matches of the day were between those at either end of the groups, with Claire beating Elvira 6/0 6/0, despite Elvira’s best efforts, including her trademark volleys. Penny’s score against Izzy was the same. She didn’t let Izzy get into the game, using tight serves and returns, even though Izzy volleyed well and fought every point. So, after almost 11 hours of tennis, the day’s play concluded. Everyone was pleased to find Sunday a warmer day. It began with Penny and Alex, the latter somewhat stiff and tired after her two three-set matches of Saturday. As before, Penny’s serve along the penthouse proved effective, she played a tight, accurate game to take the first set 6/0. Alex’s main success came from a number of cunning lobs into the dedans, and she had a number of game points, but not till 0/4 down did she finally get the reward of a game, and then another – helped by a double fault from Penny – and then another, to make it 3/4 to Penny. After those three games of cat-and-mouse tactics, things began to hot up with both players hitting hard and free: 5/3 to Penny. The next game saw a force to the dedans from Alex; a force to the grille from Penny; another force to dedans from Alex, and another force to the grille from Penny… could this continue? Alas, no, Alex finally made a mistake, and Penny wins the set and match, 6/3. ​Irina against Elvira was an elegant display – both players are lovely shot makers and craft beautiful strokes with style. Irina, however, was more aggressive, gobbling up any loose shots from Elvira, either banging them into a nick or subtly changing pace for a little drop into an opposite corner. Both players were using high sidewall serves to make use of the sunshine streaming in from above into the receiver’s eyes – though these high-risk serves tended to end up as faults rather than bamboozlers – and indeed the first set was ended by a high side-wall double fault, giving it to Irina 6/2. The second set continued in similar fashion, as Elvira was now grumbling at herself with a running commentary on her errors, and the occasional squeal of agony. Irina was able to just wait for her opponent’s errors, returning carefully with good placement, watching for the mistake to come. Which it mostly did… She won the match 6/2 6/0. The last group match of the day was between Freddy and Izzy. Both started off rather tentatively, with lots of errors and missed opportunities. But Freddy was more accurate in targeting the corners, and also went for the dedans very successfully. As the set went on, Freddy cut down on her errors, while Izzy continued to make rather too many and Freddy took the first set 6/0. Izzy came out for the second in better style, and won the first game. She was now playing far more confidently and freely, and it looked as if this second set would be close. But Freddy upped her game too, and shut out Izzy’s opportunities with some hard hitting and excellent volleys – she went on to roll up the set and match, 6/0 6/1. ​The Final was, as expected, between Penny and Claire (still wearing her Hat through the match, though the fleece was eventually removed). 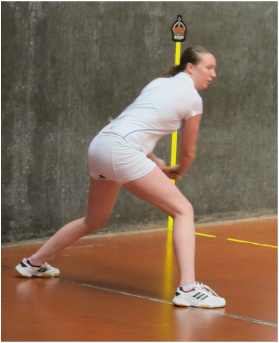 Claire walked on court looking more relaxed, and indeed she had by now got into her stride, hitting her targets with aplomb. The Winning Gallery in particular seemed a favourite. Penny was unable to put pressure on her, and though she was keeping up in the rests in her usual beautiful and balanced style, she was just losing the final shots. She kept getting herself back to the service end, with her reliable return of service into the Last Gallery. But once there, even with some very tight serving, she was unable to convert the service end into anything useful, and Claire took the first set 6/1. Claire was playing far better than anyone should do after having a baby just two weeks previously, but in the second set, Penny finally got into the swing of things, chasing down every ball, and returning just about everything. At four all, it looked as if it was even-stevens. 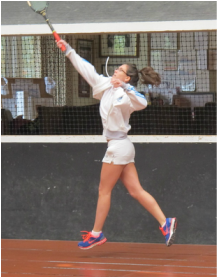 But Claire was not going to be denied – she took the next game, 5/4, and then fired off a succession of superb shots into the service forehand corner. But Penny keeps it to 30 all. Then, with Penny at the Hazard end, attacking Hazard 1 yard, Claire’s serve hits the nick…. Claire just had to defend Chase the Door to take the game and match, 6/1 6/4. All smiles, as she echoed her sister’s comments when Sarah won the title last year, thanking Sarah for not being there, and giving her the chance to take the International title away. Thanks go to Andy Chinneck and Adam Player who shared the marking on the Saturday. As luck would have it, Adam found himself marking the long matches, so Andy had the chance of a catnap! Kevin Sheldon marked all the Sunday matches, with his usual aplomb. 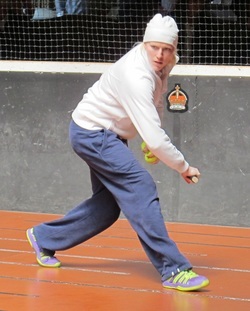 Thanks to Sir Julian Rose and the Friends of Hardwick Tennis Court for letting us use their lovely court. 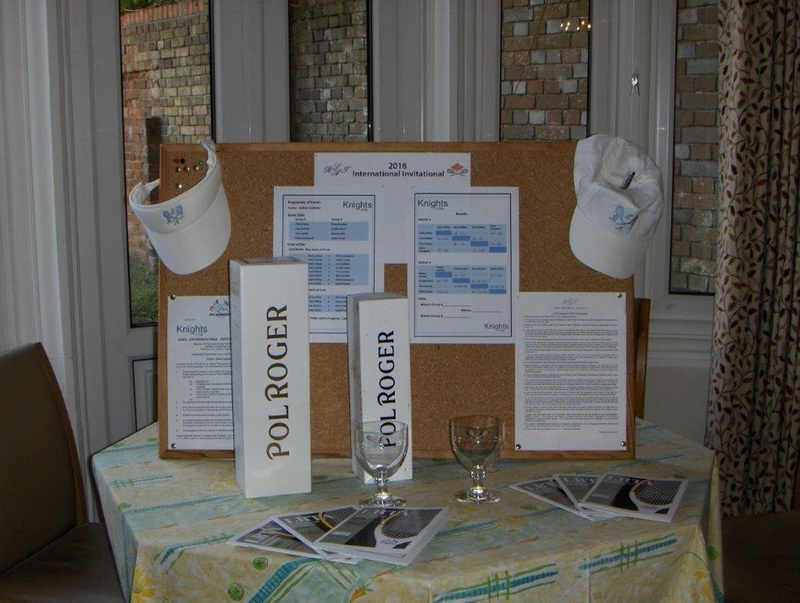 Also to our sponsors Knights, for their support, and Jane Bedford for presenting the prizes, and to Pol Roger for the Pol champagne prizes. 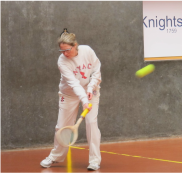 Candida Nicholls did the programme layout and Knights dealt with the printing. As usual, the catering was delicious and abundant, thanks to Katy Weston and Jill Newby. A special Thank You to Sheila Macintosh, who first ran the tournament 18 years ago and who has been involved with it ever since. And huge thanks to Lucy Hutchinson who organised the whole event, and coped with grace and efficiency with all that was thrown at her.